Q. Are you self-taught, or have you had any formal training? I finished high school with a general qualification in art and then went onto college and studied graphic design, but this was well before computers were used on a general basis. So half and half really I got a great grounding in traditional art and then taught myself how to transfer that skill set into a digital world to a point for about 10 years I only drew about a couple of dozen traditional images, and the stuff I did on the computer really was only graphic design in nature (logs and the like) but now I make sure I do at one sketch a day. Q. 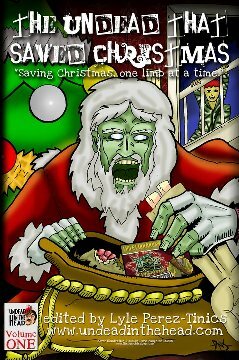 How did you get involved in the zombie community? That was via a friend called Ben Rogers, Ben belong to a mutual group of like minded men and had seen my art. 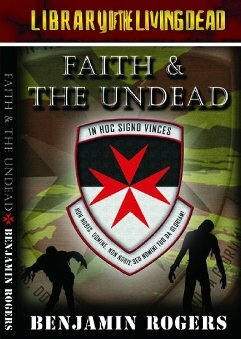 He had written a book called Faith and the Undead in which his main character were based on the medieval Knight Templar’s , he asked if I would create a Beausant logo for his characters this I did and he liked it so much he asked me to create a cover for his book. One thing leads to another and I found myself illustrating books and creating cover for several other people. I have always been a man to throw myself into a thing so here I am just under two years later which a huge circle of ‘zombie’ friends and have even started my own press to publish horror, sci-fi and fantasy books and comic books (with an emphasis on Zombie fiction). Q. Do you feel that you have a specific style, or does it change from project to project? I sometimes worry that I have a style as such but people always seem to recognize my art, I try to get it to match what the person who is paying for it wants (even if I don’t like it myself) but when I draw something just for fun yes a like it to be just ever so slightly sketchy even at the finished stage. Q. Have any other artists influenced the imagery in your creations? 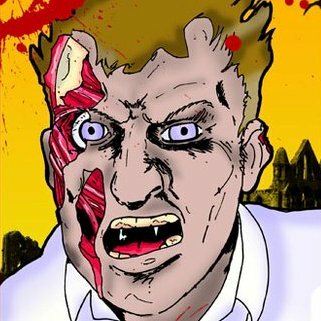 I am a big fan of lots of artists but when it comes to creating Zombies none do I have higher respect for than Nat Jones. He has an enviable talent. Other artists I love the work of work mainly in the area of comic books and I think have probably never draw more than a few zombies, one is Jim Lee who’s work on BATMAN: HUSH and continued work in the genre is amazing. Q. What effect do you want to have on your viewers? Seriously though, I want them to enjoy my images and designs as much as possible in whatever way they want, be that they get scared or have a laugh that is the fun thing with Zombies, for some they are a nightmare just waiting to happen but for others they present a comical aspect to horror, take The Evil Dead movies I just found them hilarious but other found them scary, and Zombieland was a totally parody of itself. Q. How has the popularity of online social networking affected your work? Wow…. put it this way I wouldn’t be answering these questions without Facebook, I am a huge fan of what social network sites can do you on a business level, that said it is very important to not just spam people all the time with ‘look how good I am at this’ posts you have to get a good balance, which I hope I have managed to do. 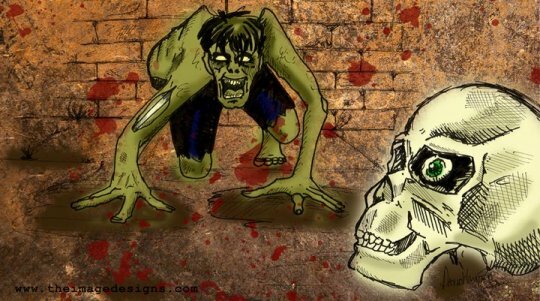 Social networking enabled me to ‘meet’ lots of people, and even as recently as May I had a brilliant time creating a Zombie a Day for the Month of May (yup that’s a Zombie a day for 31days) which were posted on the Zombie & Toys Blog. I have met a few authors via Facebook as well and have been lucky enough to work with them creating t-shirt designs for David Moody , and also creating a few illustration for his website…and a logo for Jonathan Mayberry ’s Department of Military Sciences that features in his Joe Ledger series of novels, and I’m working closely with Eric S Brown on a project I’ll share about a little later. I was also introduce to Robert Cordray via a zombie fan forum and together we created Grungebob Camo Pants the story of a kid who survives his parents in a Zombie Apocalypse. Q. What do you have planned for 2011? Where can fans find out more about you? 2011 is a busy year so far my new business KnightWatch Press will be publishing several books, including anthologies (ex: Code Z is a Zombie anthology), novels (ex: Azrael: Burning Rain by Ben Rogers is set in a post zombie apocalypse world) and novellas (ex: Dement by Lyle Perez-Tinics is about one man against a Zombie hoard ) and of course a few comic books including a four part series called ZOMpokalypse. That is some fantastic work there. Top notch if I do say so myself.